For those of you out there with a passionate fear and/or disliking of clowns, Timo Hannukkala’s iPhone app called Splat the Clown is a ‘whack-a-mole’ style game that’s great for letting out your frustrations in a relatively fun manner. After installing Splat the Clown on my 2nd generation iPod Touch (iOS 4.2), I launched myself into this application’s challenging atmosphere, my sole purpose being to slap a fistful of jelly in the face of many mocking clowns, while avoiding innocent children and making sure no clowns escape my wrath. 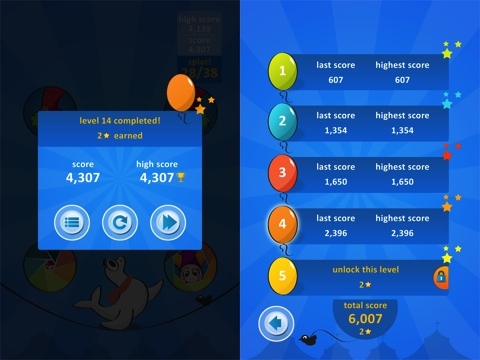 Visually, this iPhone app is simple and soft on the eyes, using a typical circus color scheme with a comprehensible layout, as well as a soundtrack built around the oh-so-familiar sounds of circus music. However, both visuals and music become somewhat repetitive, and the only thing that does seem to change throughout the many levels is the position of the targets on the screen. While it may prevent things from getting over-complicated, the lack of variety ultimately comes off as lazy and monotonous. I will say, however, that the touch screen response time is spot on. If I slam my fingertip down upon my target, I will immediate hear the satisfying “splat” of a direct hit and know that that clown received its well-deserved face full of jelly. When this is pulled off in a fluid succession, I cannot help but feel an adrenaline-fueled sense of accomplishment. As for gameplay, my frustration with this app stems from the mandatory challenge of hitting every single clown. As soon as a finger slips and the determined target escapes the player, the round is over, and the level must be replayed. On a small iPhone screen, this can get rather infuriating, especially because the player’s hand is in play the entire time and tends to serve as an obstacle. This allows an emerging clown to be easily and unknowingly blocked much too often by your finger(s). Furthermore, because you must hit every single clown that appears in order to complete a level, the desire for a high score seems rather irrelevant. Perhaps, if there was a time limit, in which a player must knock out a specific amount of clowns before the clock runs out, the competition and drive for a high score would regain its fervor. However, due to the current situation, I feel like my chances of winning are often circumstantial rather than controlled by a certain amount of skill. To end this review on a somewhat happy note, I’d like to mention that Splat the Clown is a free app, and that being said, it is worth giving it a chance. However, I personally cannot shake the feeling that this the application cannot properly balance satisfaction of accomplishment with frustration. Worth a download. 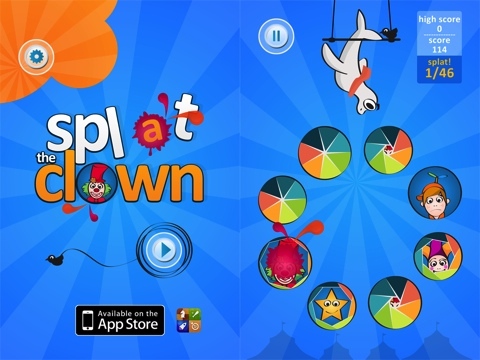 AppSafari review of Splat the Clown was written by Darius Reimm on March 12th, 2012 and categorized under Action, App Store, Arcade, Free, Games. Page viewed 3412 times, 1 so far today. Need help on using these apps? Please read the Help Page.